I enjoy reading Narnia aloud to my kids above all other books. I love the story, the imagery and the wonder which is this magical world created by C.S. Lewis. On the other hand, he also was a Christian and an intellectual thinker and those facts, by their very nature, means that his Christianity would have been present in all that he said and wrote. It's stilly to argue that these books are not Christian because his worldview would naturally be present in his writings. He said once that if these books have a Christian element to them, they might make the Christian faith more familiar to children when they are older. If a child were to read these books when they were young, and then they grew to be an adult and were to hear the Gospel message preached straight, there is more of a likelihood of them saying, "This is familiar to me already" instead of it being a foreign concept. Whichever direction you lean, the majority of people do seem to hold that the Chronicles of Narnia is an excellent series of children's books. Furthermore they have stood some test of time, never having suffered the indignity of going out of print. 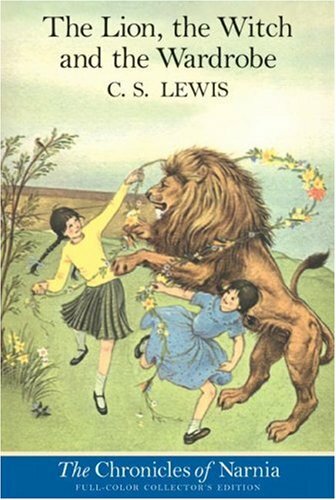 The Lion, the Witch and the Wardrobe was the first of the Narnia books published and it appeared on the scene in 1950, over the objections of J.R.R. Tolkien who found the story to be "carelessly and superficially written." If you are wanting to read the books in chronological order, you'll want to begin with The Magician's Nephew which explains the beginning history of Narnia. Personally, I prefer starting with (and returning to as frequently as possible) the second book (chronologically speaking) but first published - The Lion, the Witch and the Wardrobe . It is my favorite of the entire series. In my opinion, The Lion, the Witch and the Wardrobe really tells us who Aslan is, explains why we should care about Narnia in the first place, and sets the groundwork for all of the subsequent books. In this book we are introduced to the four Pevensie children: Peter, Edmund, Susan and Lucy. They are sent to live with an old professor in his English country manor during the height of World War II. In this quiet English manor the children discover a magical wardrobe which ends up leading them into the land of Narnia. They quickly discover that Narnia is under the spell of the White Witch who makes it always winter, but never Christmas. At the same time that the Pevensie children arrive in Narnia, Aslan also appears on the scene and the story of The Lion, the Witch and the Wardrobe tells of the four children's adventures with Aslan in defeating the White Witch. As I said, one thing I love about this story is the symbolism of the characters and who and what they represent. When I read Narnia by myself or to my kids my heart literally swells so that I find it might burst. I am frequently choking back a tear as Lewis describes truth and beauty in a way that I've not experienced from any other author. (Excepting perhaps Lucy Maud Montgomery but for different reasons and in a rather different manner.) These books move me and I just adore the opportunity I have to share them with my kids. "I-I wonder if there's any point in going on," said Susan. "I mean, it doesn't seem particularly safe here and it looks as if it won't be much fun either. And it's getting colder every minute, and we've brought nothing to eat. What about just going home?" This time I read the book I saw myself in Susan more than I ever have before. I'm a strange mixture of courage and caution and depending on the activity you'll get different things out of me. I very decidedly believe in Jesus Christ but this does not mean that I don't have hesitations when it comes to following hard after Him. Lately it seems that He would ask me to do hard things - harder than I planned on. And the weather is cold and it doesn't look like much fun to obey. In fact, I think I'd rather not obey, truth be told. I'd rather "go home." But if in these moments I chose to go home and feel temporarily warm, I'll miss the destruction of the White Witch and wouldn't that be a sorry thing for me and everyone? Moving on, we got to the part where it is discovered that Mr. Tumnus has been taken by the White Witch after helping Lucy to escape. "Couldn't we have some stratagem?" said Peter. "I mean couldn't we dress up as something, or pretend to be - oh, peddlers or anything - or watch till she was gone out - or - oh, hang it all, there must be some way. This Faun saved my sister at his own risk, Mr. Beaver. We can't just leave him to be - to be - to have that done to him." "It's no good, Son of Adam," said Mr. Beaver, "no good your trying, of all people. But now that Aslan is on the move -"
I was so encouraged by this read, as I am every time I read it, albeit for different reasons. I am entertained by it, yes. I always get a chuckle out of Mrs. Beaver and I thrill when Edmund shows his smarts and breaks the witch's wand. It's a thrilling good tale full of good guys and bad and my kids love to hear it as I love to read it. When we finished up the book, Bookworm1 asked me, "Can we read another?!" I replied that I would be happy to read Prince Caspian, starting the next day. "No, TODAY!" he replied. I won't deny it thrills me to the core to hear him so eager to get back into Narnia the moment he is out of it. I hope and I pray that will always be the case. I love Narnia! My daughter and I will be reading this series during our homeschool year and I'm so looking forward to it. I've never read them aloud because I get too choked up but we've listened to the audio books and Focus on the Family radio drama numerous times. And I agree, when you're meeting Aslan for the first time it MUST be with Lucy. Definitely not the Magician's Nephew! Your passion makes me happy for Narnia, too! We have a few Narnia picture books. My oldest recently pondered, "I wish we had the real books!" I still need to dig it out...not sure where it is after my initial search. It's been way too long now since I've read Narnia out loud to a child. Back when I was in college, I read The Magician's Nephew out loud to one of the kids I babysat. He was absolutely entranced by it--although, by the end, he was begging to read it *himself*. Now I don't know any kids in town :-(, but maybe someday I'll be able to enjoy Narnia through the eyes of a child again. Your Narnia reviews always make me want to go back and dive into them again!! I just love, LOVE the way knew things stand out with each reading. That Lewis sure could write a multi-faceted story! Your particular things you highlighted this time--wow!! I, too, think I can fix things on my own (oh yes, go ahead and laugh, for the idea is laughable!) and like Susan, I would rather not face the cold, but be comfortable. Eric was just wondering about reading this series aloud to Nathan. Thanks for the thoughts. Surprised at Tolkien's opinion of this book! This is one of my all-time favorites. I'm fascinated at how an intellectual can write such moving books for children that appeal to adults as well and portray truth and beauty so spot on to both sets. I read these multiple times as a kid, and that was after my mom read them to us. My kids, of course, have heard the first several, although we haven't done The Last Battle yet. I think it might be a bit much for my younger son at his age. My dad introduced me to the Sci-Fi series, but I have had difficulty finding decent copies these days.